The Web is full of ‘best ever’ Banana cake/bread recipes and while I have not, by any stretch, tried them all my search is over. 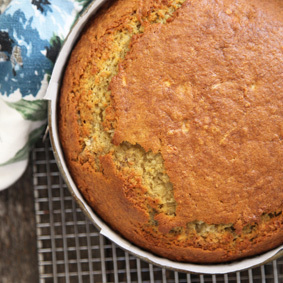 Annabel Langbein, a cook and writer whose style and food Jo and I rate so highly she is on our short list of the only cook books you will ever need, has, in my humble opinion, the banana cake recipe that takes the cake (I crack myself up). The only change we have made is simply that we use duck eggs from our free range Cayugas and Khaki Campbells for pretty much all our baking now. I think cakes made from duck eggs are lighter, moister, have a better crumb and just plain taste better. Anyway give it a crack and let me know what you think and check out Annabel. Oh and cut it thick and toast it. It takes it to a whole other level!! Preheat oven to 170°C. Line a medium (23cm-diameter) cake tin with baking paper or prepare four 10cm-diameter tins (recycled large 425g tuna cans are perfect) or 12 muffin tins. This entry was posted in Cook, Ducks and tagged Ducks. Bookmark the permalink. At the risk of alienating the allergy prone I like your thinking. All the more cake for us!! Yum yum.